Like many, I am on an endless journey to find an exercise regimen I can stick to. As you may have already guessed, I LOVE to eat. And because I LOVE to eat, I need to stay active. I'm a pretty active person. Mr. A often points out to me that I cannot sit still and do nothing. Being active is very natural to me; EXERCISING on the other hand is very unnatural. Oh how I wish I were the type of person who has a natural desire to go to the gym. That "natural desire" is a completely foreign notion to me. I don't mind exercising once I am AT the gym, it's the mental fight I have with myself convincing myself to go TO the gym that I mind. For some reason, there is always something that sounds a lot more fun and exciting to do (such as baking cookies or watching reruns of FRIENDS!) I'm not fat (not that there is anything wrong with being fat) but there is always room for improvement and we can all lose those extra 5 pounds. Lately, my new "Thing" is going to boxing and kick boxing classes. It started out well. I was on a roll and was going a few times a week and then suddenly, there was a kink in the chain (aka beautiful, sunny vacation.) Suddenly, going to a boxing class and being paired up with people who are 20 times better than me simply did not look very appealing. (Can you blame me?) I know that there is a learning curve and that the people around me were not always as good as they are today. I know that I am improving with every class but I am not as good as I want to be. I'm not THERE yet. Here's the truth though: I will never get "there". "There" does not exist. I will always want to improve and surpass myself so "there" will always be pushed further and further away. Remember when I said last month that this blog is feeling very therapeutic? I'm hoping that by the end of this, I get this aching feeling to go exercise. 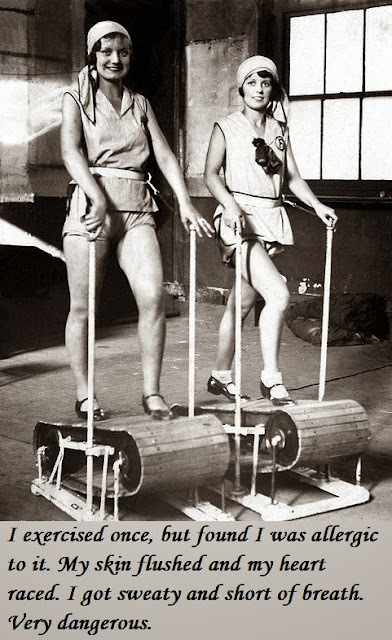 Truth is, I actually AM getting an aching feeling to go exercise. The aching feeling is guilt (and maybe a bit of shame). It may not sound like positive feelings but guilt and shame can actually BE positive if they get you moving. The trick is to keep the guilt trips short to avoid getting into vicious loops of negativity. I just want to point out that I absolutely hate how society has tried to brainwash us and convinced us that beauty is synonymous with skinny and that anybody who does not fit in the "skinny" category is lazy, ugly, undetermined and has no self-control. I am NOT pro-Skinny; I am pro-Health and pro-Balance! I watched an episode of "Extreme Makeover: Weight Loss Edition" a few days ago. A young woman in her twenties weighing over 300 pounds wanted to lose more than half her body weight. I admired the determination and the drive this girl had to reach her goal. And although I (sometimes) find weight loss shows on TV entertaining and inspirational, I also find them extremely upsetting and delusional. These shows concentrate on a very unhealthy ratio. Maximum amount of exercise that one can endure without killing themselves + minimum amount of food and calories that one can consume = weight loss. I would much rather opt for maximum amount of calories that does not trigger weight gain + stable, maintainable and healthy amount of exercise = weight loss. Granted, you will not lose weight as quickly with the second equation, but you'll surely keep your sanity and prevent gaining that weight back! A little ironic & somewhat disturbing but still funny enough to share. 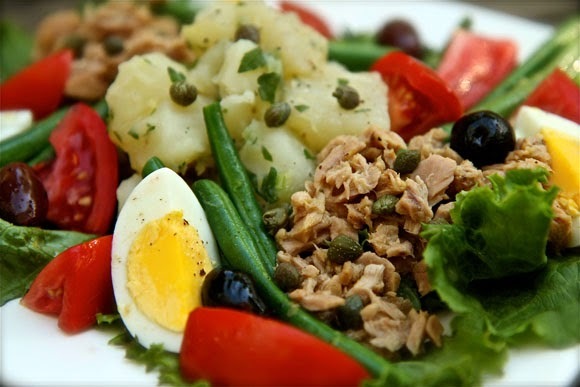 To stay in the theme of health and balance, here is a wonderful recipe from one of Julia Child's cookbooks: Salade Niçoise. 1. Shortly before serving, line a handsome, large and wide salad bowl or a roomy platter with lettuce leaves, drizzle a little olive oil on them, and dust with a sprinkling of salt. 2. Toss the beans in a mixing bowl with a little of the dressing, and correct seasoning. 3. Drizzle a spoonful or two of the dressing over the tomatoes. 4. Season the tuna lightly with a spoonful or two of dressing. 5. Place the potatoes in the center of the bowl or platter; mound beans at strategic intervals, interspersing them with tomatoes and mounds of tuna. 6. Ring the salad with the eggs and curl an anchovy filet on top of each. Mince the lemon peel very finely with the salt, scrape it into the mortar or bowl, and mash into a fine paste with the pestle or spoon. Beat in the mustard and 1 tablespoon of the lemon juice; when thoroughly blended start beating in the oil by droplets to make a homogeneous sauce—easier when done with a small electric mixer. Beat in droplets more lemon juice and salt and pepper to taste. 1. Fill a three-quart saucepan half full with cold water. 2. One at a time peel a potato, and if it's round and fat rather than long and thin, cut it in half lengthwise. Cut the potato into slices 1/4 inch thick, and drop the slices into the pan of water, to prevent discoloration while you prepare the rest. It is best to cook them within 1/2 hour to prevent the possibility of their turning grey. 3. Drain out the water, then add clean cold water to cover, and the salt. Bring to the simmer, and simmer 2 to 3 minutes, or until the potatoes are just tender -- keep testing by eating a slice to be sure. Crunchily undercooked potatoes are dreadful, and overcooked potato slices will disintegrate. 4. Drain out the cooking water (you may wish to use it for soup). At once cover the pan and set aside for 3 to 4 minutes (but no longer than 5), to allow the slices to firm up. Then uncover the potatoes and plane to season them while still warm. 5. Turn the warm potatoes into a roomy bowl and toss gently with the shallots or scallions, stock or cooking water, vinegar, and parsley. Let steep 10 minutes or so, tossing gently several times. Then correct seasoning, toss with the optional oil, and the potatoes are ready for serving. The potatoes will keep a day or two covered and under refrigeration. 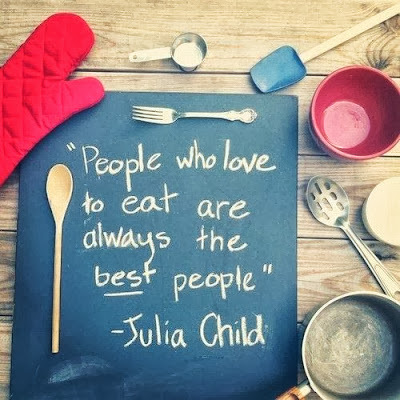 If they are made with oil, let sit for 1/2 hour at room temperature before serving.